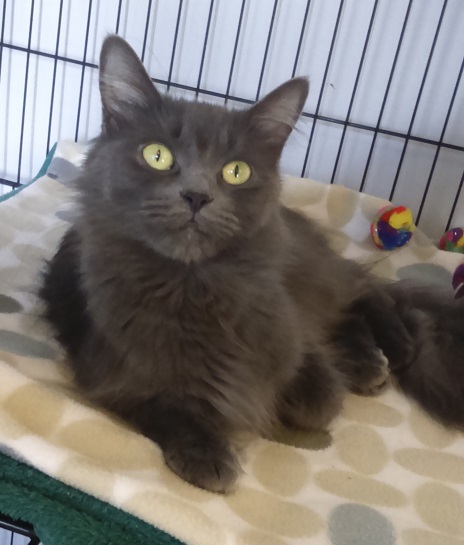 This gorgeous two year old, long haired grey kitty was found pregnant by one of our clients. They took her in and now that all of her kittens have found a home it’s her turn. Blue can start out a little shy in new situations but she very quickly settles in and becomes an outgoing purr bucket. She adores attention and would like nothing more than to spend all her time showing how thankful she is to have someone to love her. She is very delicately built, FeLV/FIV negative, and has been spayed and vaccinated so she is ready to find her new family.